In recognition of the effort of the best performing Advanced Surgical Trainees (ASTs) in the nine (9) surgical specialties, as well as, to encourage the ASTs to excel in their exit examinations, the College of Surgeons has decided to establish the College of Surgeons gold medal as an annual award as approved by the Council 2008-2009 at the 2nd College Board Meeting held on 24 July 2008. The idea was mooted by the Council 2007-2008 at the 5th College Board Meeting held on 5 February 2008. ASTs who have passed their exit examinations in Singapore and completed their traineeship with the Joint Committee on Specialist Training (JCST) in the year the Award is being presented. In the year when the Award is being presented and there is no exit examination held in Singapore, results of exit examination held in an examination centre outside Singapore will be taken into consideration. In the year when the Award is being presented and there is no exit examination being conducted in that year, the best performing AST in the exit examinations of the preceding year will be considered. The conduct of ASTs during traineeship period will also be taken into serious consideration as part of the assessment of qualifying for this Award. The Award shall be given to the best performing AST in the exit examination of each surgical specialty, as judged by the Specialist Training Committee (STC) of that specialty, with the proviso that the conduct during traineeship period shall be good to exemplary. Only one Award shall be given in each surgical specialty. Only in exceptional circumstances, when there is a tie in the results of the exit examination in the specialty and that the conduct of these ASTs during their traineeship period is equally outstanding, a maximum of two Awards will be given out to that specialty. The Chairman of the STC of the nine (9) surgical specialties will be given written notice through the JCST on the date of the Award ceremony and nomination of the best performing AST in the nine (9) surgical specialties shall be submitted using the prescribed form to the College of Surgeons at least three weeks before the date of the Award ceremony. Only exit examination results before the closing date of nomination submission shall be considered for the Award. The Award winners will be invited to attend the Award ceremony at an event organized by the College of Surgeons and shall receive a gold medal each. The College of Surgeons reserves the right to publish all details (including names of winners and their employing hospital names) in the Newsletter of the College of Surgeons, Singapore, as well as, in the AMS News of the Academy of Medicine, Singapore. The First Joint Meeting of the Royal College of Surgeons, Edinburgh and Chapter of Surgeons, Academy of Medicine, Singapore in November 1984 inaugurated a Surgeon-in-Training Award. The Award was presented to the best original unpublished paper read by a Surgeon-in-Training. Surgical trainees from Singapore and other countries submitted excellent and commendable work. The six papers which were subsequently shortlisted for presentation at the Award session were of remarkable standard and quality. 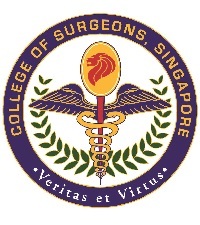 The College of Surgeons, Singapore (then Chapter of Surgeons) agreed that the Award should be perpetuated to encourage young surgical trainees to continue pursuing surgical research and producing papers of the highest standards. The Award will be presented biennially at the Annual Combined Surgical Meeting / Annual Scientific Meeting or in the Singapore-Malaysia Congress of Medicine when it is held in Singapore. The Award will be given for the best original unpublished paper read by a young surgeon. Submissions must be of single authorship. A Young Surgeon is defined as someone below 35 years of age who has not yet attained a hospital Consultant position on the date of submission of the paper. The Award is confined to young surgeons practising in Singapore. Only original work carried out in the Singapore-Malaysia region by the doctor that has not been previously published will be considered. This does not exclude papers read at Conferences outside the Singapore-Malaysia region that might have been published in proceedings or abstracts. The Award winner will be eligible to apply to the Council of the College of Surgeons, Singapore for funds to attend an international meeting of his/her specialty. The sum for the Award is capped at S$4,000.00. The winner will also receive a Certificate for the Award. The College reserves the right to publish, in full, the paper selected for the Young Surgeon’s Award in the Annals of the Academy of Medicine, Singapore. This Lectureship would be organised annually at any of the College Meetings during the calender year (Jan – Dec). Nominations will be received from the College Council Members for confirmation by the College Council. Nominee can be a local surgeon working in the field of surgery or a non-surgeon who is of a reputable status to be nominated worthy of this Lectureship. The recipient of this award will deliver a lecture at one of the College’s Meetings/Conferences/Seminars. The recipient of this award will be presented with a College medal and a certificate. The College reserves the right to publish the College of Surgeons Lecture in full in the Annals, Academy of Medicine, Singapore. In recognition of the outstanding contributions to the development of surgery in Singapore by Dr Yahya Cohen, the 1st Chairman of the Chapter of Surgeons and a past Master of the Academy, the 1994 Chapter of Surgeons has decided to establish the Yahya Cohen Memorial Lecture in his honour. The Lectureship will be presented annually and the lecture shall take place at an event organised by the College of Surgeons (formerly known as Chapter of Surgeons). Only Fellows of the College of Surgeons shall be eligible for the Lectureship. The award of the Lectureship shall be given for the academic excellence to the main author of the best scientific paper published in the 24 month period ending 31st December of the preceeding year, as judged by a panel appointed by the College. In exceptional circumstances, two papers may be judged worthy of the award and the award be given to the main authors, who are the First Authors or the principal investigators, of the papers so judged. The main (first author or principal investigator) of the paper shall be the presenter and be recognized as the Yahya Cohen Memorial Lecturer. Fellows of the College of Surgeons will be given written notice of the Lectureship and be given a period of at least one month to submit their application/nomination for the Lectureship. The nomination for the Lectureship will be on prescribed form which should state clearly the title of the paper, the main (first author or principal investigator) author being nominated, the names of the co-authors and their consent for the main (first author or principal investigator) author to accept the Lectureship. The published paper must accompany the nomination form during submission. Only originals of the paper and the form will be accepted. Each Fellow may submit only one paper for consideration. The Lecturer will be awarded a gold medal and a certificate. The co-authors of the paper will be given certificates to recognise their contributions. The College reserves the right to publish the Yahya Cohen Memorial Lecture in full in the Annals, Academy of Medicine, Singapore. 1998 3rd Dr London Lucien Ooi The Role of the Myofibroblast-Like Cell in Hepatocellular Carcinoma - Host Defence? The College of Surgeons, Singapore Travelling Fellowship was initiated in 1997 by Dr V K Pillay, a Past Master, who in addition to his own donation, has raised funds from the World Orthopaedic Concern, the Lee Foundation and the Shaw Foundation. There will be at least one award annually. Only Fellows of the College of Surgeons, Singapore shall be eligible. The Fellowship is to enable surgeons of the College to visit and participate in teaching programs, attend conferences/seminars/workshops/meetings/events overseas to have a better understanding of the surgical problems in the developing world and also, to gain knowledge on the development/advancement of the surgical specialties. This Fund can also be used for doing of any clinical research in collaboration with medical institutions/colleges in other countries. The annual total reimbursement is capped at S$18,000. Recipient must submit a written report to the College President upon return from the trip. Dr Bertrand Sonnery-Cottet is specialized in the repair of joints and ligaments after sport trauma. Dr Sonnery-Cottet will be presenting the findings of 2 clinical research studies, on 1. Anterolateral Ligament Reconstruction and 2. Epidemiological Evaluation of Meniscal Ramp Lesions respectively. Professor Philip Calder will be sharing the evidence based research on Omega-3 acids and its influence on health outcomes in inflammatory diseases, surgical ICU and the effects of immunonutrition in different types of surgery.